On a chilly November morning I knocked on the door of 381 East 165th Street in the Bronx, a short walk from the busy, modern stretch of the Bronx Judicial Center complex on 161st Street, the tracks of Conrail and Metro-North just steps away on Park Avenue. My visit to this storied mansion, a hold-out from better days, was pre-arranged. As with so many of my projects, a chance encounter with this magnificent home had sparked my interest some ten years before. 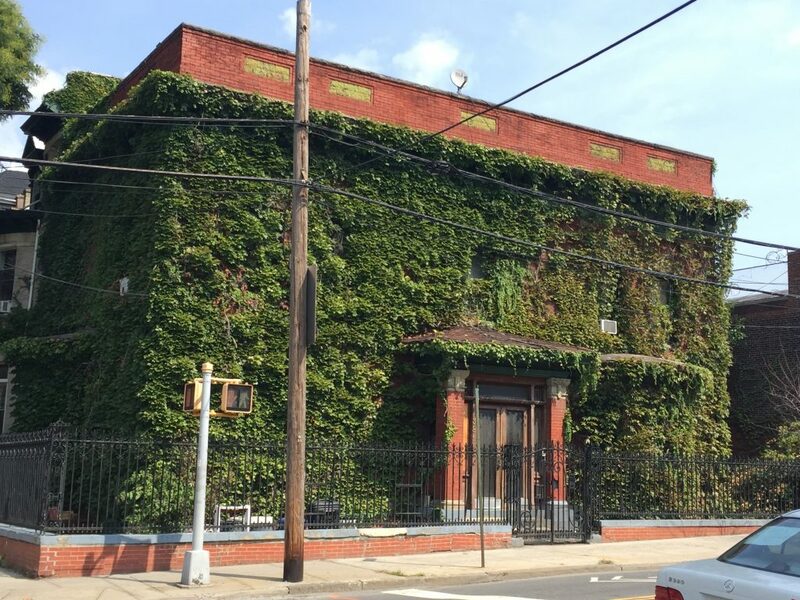 Tucked away in my list of things to look into was this ivy-covered manse, one of the strangest structures I’ve ever encountered in an old New York neighborhood. So long ago was my first visit, I’d in fact forgotten its exact location. 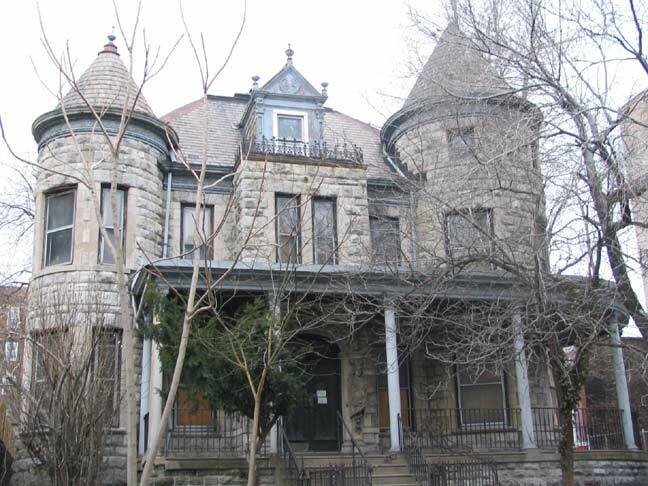 While perusing a website article about the derelict Shuttleworth Mansion on Mount Hope Place at Anthony Avenue, I decided to visit no matter what it would take. First, in mid-September, I visited Shuttleworth’s cut-stone, veranda-wrapped glory on a warm, early autumn afternoon, just south of Tremont Avenue. The wonder of this haunted house, sitting among 6-story apartment houses just south of the Cross-Bronx Expressway fueled my flaneur lust: the juxtaposition of faded early 20th century upper-middle class glory hard by the grittier parts of the mid-Bronx spurred me on. After standing in the street marveling at Shuttleworth’s creation and immersing myself in the sights, smells and sounds of a Pentecostal Church BBQ and salsa party just up the block, I was ready to do the deed. For the next two hours I drove slowly up and down the blocks to the south, down to Webster Avenue, then south to 161st Street and over to Park Avenue, the only marker I truly recalled. I was exhausted, and menaced with frustration, my cat in his cage in the back seat yowling for release, even though we still had ahead of us a two hour drive upstate to my country house that I’d planned for later that day. It always happens this way: you’re ready to give up. Then you turn a corner. And wham, one’s obscure object of desire smacks you in the face. So it was with 381 East 165th Street. Crossing eastward to Park Avenue for the tenth time as I threaded the huge needle, at the corner of Clay Avenue, there she blew. I parked my car in a shady spot, stepped out on dream-driven feet and gazed, stared, consumed the glory of a time long-gone, enmeshed in the wonder of whose it was and what the inside looked like. Was it truly undivided into apartments, as the single door bell indicated? 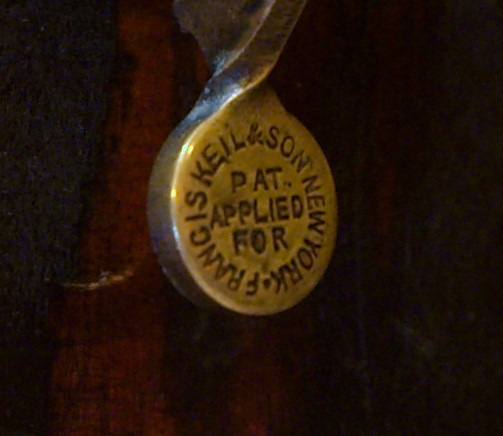 How much original detail remained? And what luck it would be to gain entry! I decided, rather than ringing the bell, to go about this task methodically, finding the owner’s identity and contact information straight up. I have a shpiel I use for these occasions to justify my interest and establish some street cred with wary New Yorkers. Like a knife through hot butter, it worked this time. Searching ACRIS, the online NYC property information system that provides images of recorded property documents for many decades past, and 411.com, I quickly determined the name and phone number of the last owner of record. Rehearsing my introduction, I dialed the number and left a message. Within hours, a call came back: an ostensibly elderly African-American female voice greeted me and we chatted easily, me establishing my bona fides, and she welcoming a visit in a month or so after she returned from her sojourn in South Carolina. I made a note in my calendar to call her in early November and lo and behold, it all worked out. A follow-up call received the same welcome and I made a date to visit. Confirming that morning, I was told to just ring the bell. 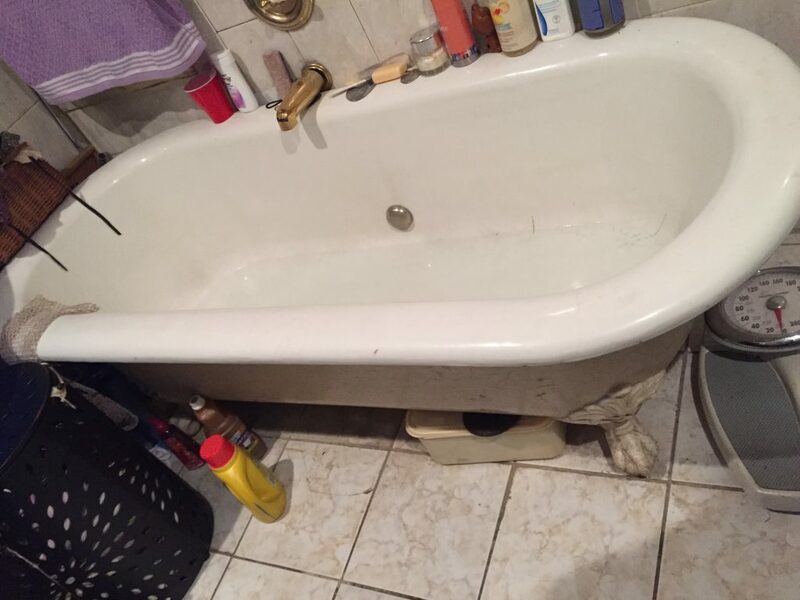 The owner’s daughter is the actual inhabitant, and sure enough, a 20-something young lady answered the door. Kiesha (not her real name) was home mid-morning, her 5 year old son having been put on the cheese bus that morning for school. Somewhat apprehensively, I accepted K’s eager invitation to enter, and I was pleasantly surprised at her articulateness and open-minded acceptance of my mission. Despite a poor education and difficult life circumstances, K.’s mind was also full of hope and wonder, touring me as long as I wished in the interior, explaining all she knew of the house’s inner workings, totally appropriate and accepting of this strange white guy who showed up at her door. 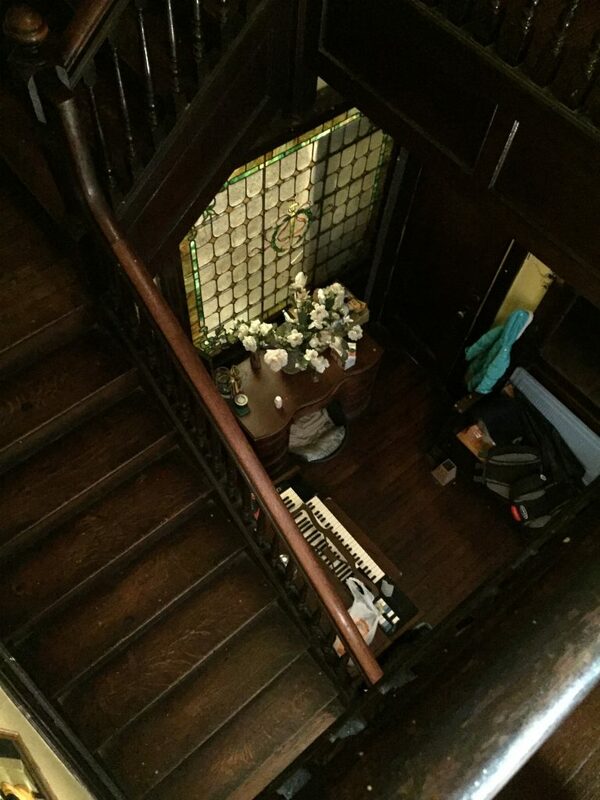 Though the mansion has in fact never been cut up, many original details are either dilapidated or obscured by the piles of bric-a-brac filling each room, perhaps not the Collyer Brothers, but a good clean out is due. 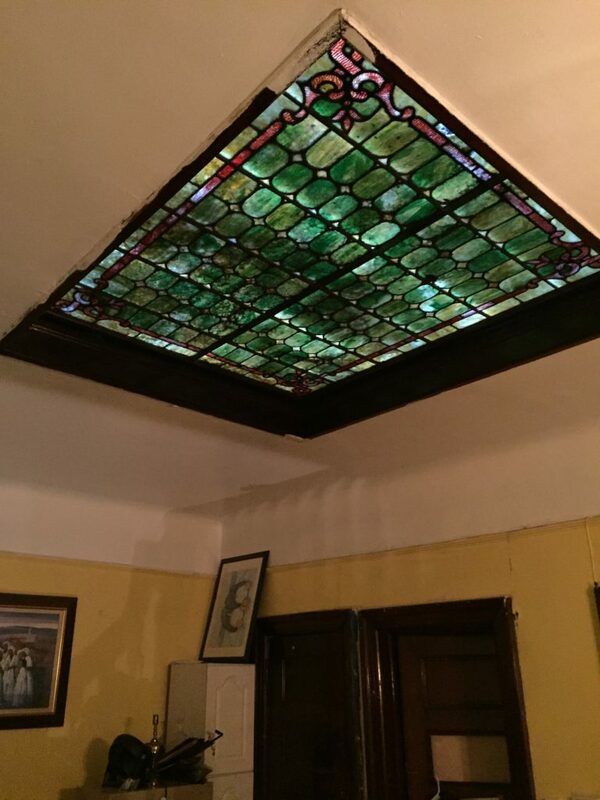 Much original detail remains in the home, from panelling to stained glass windows and a glorious skylight above the main staircase, and the original massive bathtub remains upstairs, suitable for President William Taft. Our conversation ranged all over, from education and public school kindergarten to classic literature and K.’s hopes and dreams of writing her memoirs at even such a tender age. With profuse gratitude, I said goodbye, urging K. to send me something she’d like me to read and edit. It hasn’t happened to date, but I hope she will. 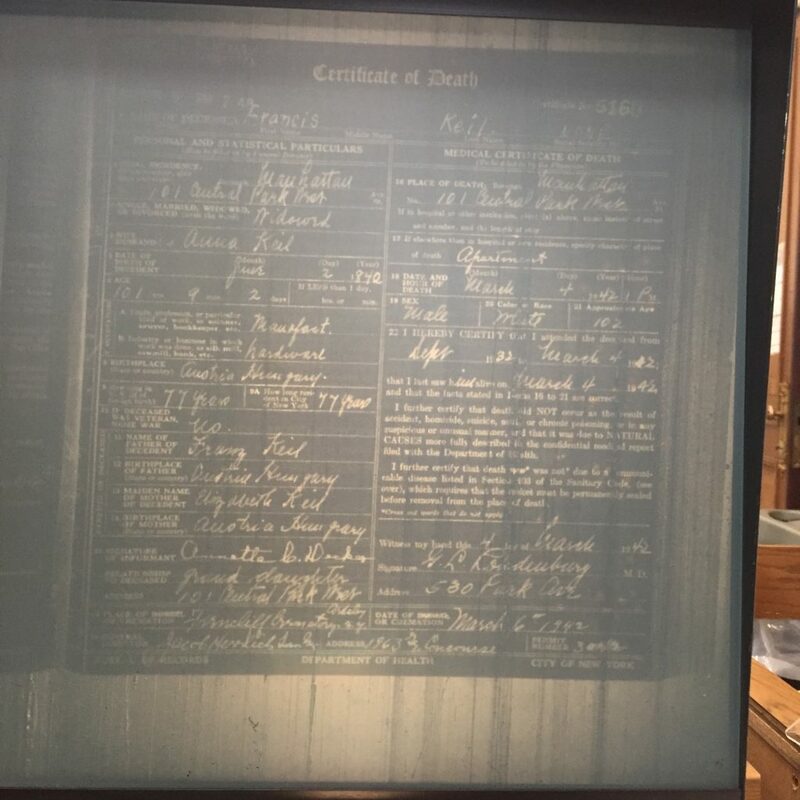 Born in 1840, Keil lived a very long life, passing away at 101 years of age. He turned over his Bronx home to his employee F. A. Wurzbach in and moved to the stately 101 Central Park West in Manhattan, where he died at home in 1942. Wurzbach retired as general maanager of the Keil enterprise at Melrose Avenue and East 163rd Street in 1927 and lived in the home until his death in 1950, according to his obituary in The New York Times. 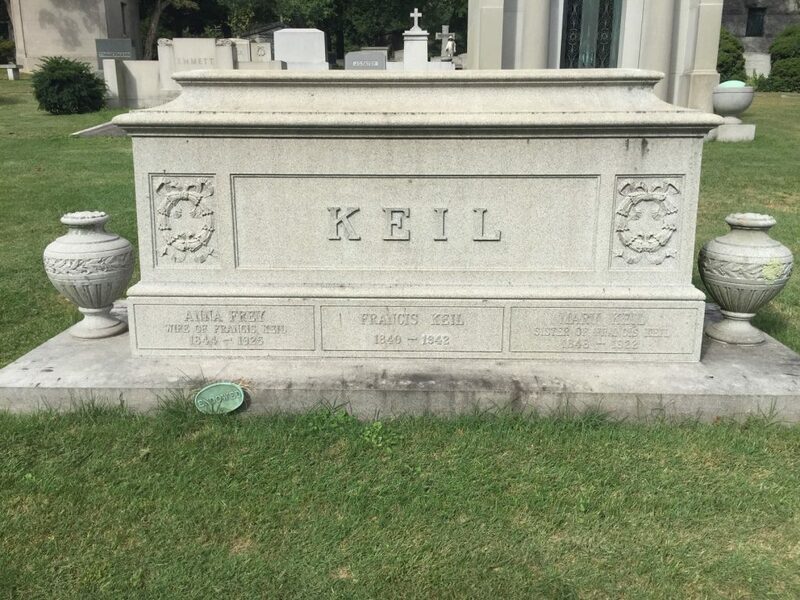 Predeceased by his wife, Francis Keil’s ashes were interred alongside hers in a stately but modest tomb at Woodlawn Cemetery amongst the grandiose mausoleums of industrial and commercial titans of the 20th century such as Frank Woolworth. 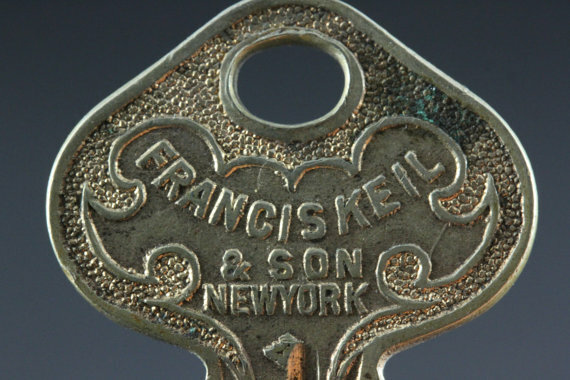 Francis Keil’s reputation and fame as an inventor, designer, and manufacturer of clever and frequently ornate items remains to this day among the cognoscenti of locks and keys as well as cabinet hardware. 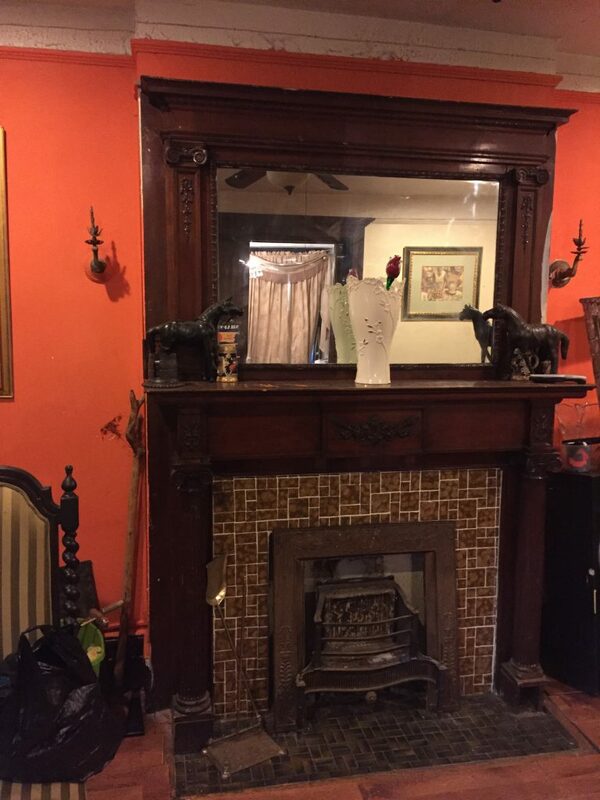 Search E-bay or any other auction site and you’ll find dozens of specimens of his prowess. Days long gone by on Clay Avenue, for sure. I’m glad I unlocked a story worth telling.